Are the British More Open about Nuclear History than the U.S.? Recent declassification decisions by a committee representing the Department of Defense and Department of Energy have simultaneously advanced and set back the cause of transparency for the history of the U.S. nuclear posture. In response to a request by the National Security Archive, the Formerly Restricted Data Declassification Working Group (FRD DWG) have declassified the numbers, in the thousands, of nuclear weapons carried on U.S. Navy surface ships during the Cold War, from 1953 to 1991. Yet, they denied a related request—for declassification of the numbers, which also ran into the thousands, of U.S. nuclear weapons deployed to NATO Europe during the Cold War. Even though the NATO deployments have long been overtaken by events—only a few hundred remain in Western Europe—they are likely to remain secret for the indefinite future. What made the declassification requests possible was a provision in 10 C.F.R. 1045.20 concerning information classified under the Atomic Energy Act (Title 10 refers to the Department of Energy). Under this provision, it is possible to file a petition with the Department of Energy to request the declassification of Restricted Data (RD) and Formerly Restricted Data (FRD). Because RD generally concerns the design of nuclear weapons and the manufacture of fissile material for substantive policy reasons it often remains classified. FRD, by contrast, concerns classification controls over the military use of nuclear weapons, including weapons yields, stockpiles, deployments and storage arrangements. In this area the Pentagon, far more than the Department of Energy, has had a major role in using and protecting FRD and in resisting its declassification. To test the boundaries of the declassifiable, the Federation of American Scientists’ Steven Aftergood has pioneered using the DOE’s rules to secure the declassification of important information about nuclear weapons. In 1993, a few years after the Cold War ended, the Clinton administration, with Secretary of Energy Hazel O’Leary in the lead, disclosed the numbers of U.S. nuclear weapons through 1961. Yet, no breakdown was provided, for example, of weapons deployed in specific regions or to specific forces. All of that remained secret, which meant that important elements of Cold War history also remained shrouded. For example, that the United States had thousands of nuclear weapons deployed overseas remained a significant puzzle. In order to back up U.S. diplomacy and to validate security guarantees and to deter political and military pressure from the former Soviet Union and its allies, the Pentagon deployed thousands of tactical nuclear weapons around the world, from Northeast Asia (South Korea and Okinawa) to Western Europe (primarily in West Germany) as well as the Atlantic and the Pacific. Moreover, overseas deployments were often related to war plans—nuclear weapons on aircraft carriers were tied in commitments for war plans against the Soviet Union and Warsaw Pact countries and to a lesser against, China. Likewise, nuclear bombs assigned to NATO aircraft had SIOP targets. The facts of those deployments along with their numbers were highly secret, although sometimes policymakers leaked information to the press. It was not until 1999, years after the Cold War had ended, that the Pentagon responded to FOIA requests by releasing parts of a top secret historical study on the history of custody and deployment arrangements. Yet much remained classified, including numbers of weapons overseas and most of the countries where the weapons were deployed although educated guesses were possible. 16 years later, the situation has not changed (although former Secretary of Defense Robert Gates released more aggregate stockpile numbers). For example, that Washington deployed nuclear weapons in Italy and Turkey, the Netherlands and Belgium, and other parts of the world remains an official secret. The numbers of weapons assigned to surface naval forces has also been classified. To try to get some light shed, the National Security Archive has from time to time requested declassification review of major studies of the overseas stockpile, but basic facts remain classified. Following the example set by Steven Aftergood, during 2014 the Archive petitioned the Department of Energy for two sets of information: 1) aggregate numbers of U.S. nuclear weapons deployments to Western European NATO countries for each year from 1950 to 1991, and 2) aggregate numbers of deployments of nuclear weapons “afloat” on U.S. Navy surface ships during the Cold War, with breakdown by ocean/sea (Atlantic, Pacific, Mediterranean). 1991 was an appropriate cut-off because that year President George H. W. Bush ordered the withdrawal of all Naval nuclear weapons (except for submarine-launched ballistic missiles) and the withdrawal of all but a few hundred nuclear weapons from NATO Europe. Under the regulations, the Department of Defense, the Department of Energy, and perhaps the Department of State (which historically has managed the diplomacy surrounding nuclear weapons deployments) would coordinate a response to the petitions. The FRD DWG gave an affirmative response to the request on naval nuclear weapons. Recently the Department of Defense posted on its DOD Open.Gov Web site declassified tables identifying numbers of U.S. Navy nuclear weapons afloat, with a breakdown by geographic location. What is surprising is that there were thousands of naval nuclear weapons beginning in the 1960s. But a previously posted declassified National Security Council study from early 1972 provides similarly large numbers for naval nuclear weapons (see page 35). The original request was narrowly phrased, asking only for a geographic breakdown, but it is unfortunate that the Defense Department released the numbers without explanation. Yet the gross numbers provide a sense of the massive scale of the navy’s nuclear operations. Presumably “weapons afloat” includes warheads for missile reentry vehicles on submarine-launched ballistic missiles, nuclear bombs and depth charges on carriers and other nuclear weapons carried on surface ships and submarines, including torpedoes, ASROC (anti-submarine rocket), TOMAHAWK ship-launched cruise missiles, TALOS anti-ship weapons, and TERRIER air defense weapons. The total very likely includes weapons deployed on ammunitions ships, on submarine tenders, in magazines on naval bases, but also U.S. weapons assigned to NATO allies (such as anti-submarine warfare weapons to the Netherlands). The Archive has filed a request with DOE for a more detailed breakdown. 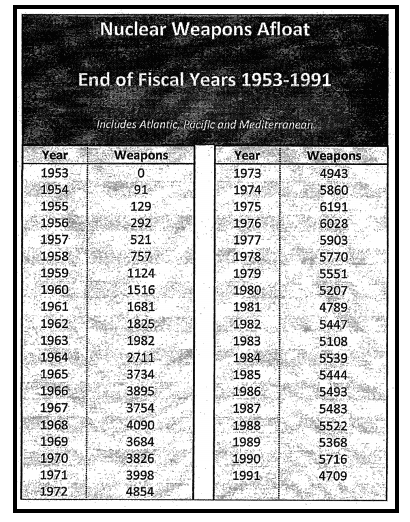 Nuclear Weapons Afloat: End of Fiscal Years 1953-1991. The tables for the Atlantic, Pacific, and Mediterranean do not include the years before 1961, although the annual grand totals in the first table begin with 1953. Perhaps the data breaking the deployments down is unavailable or the researchers did not know where to look. No security reason would seem to be at issue. By 1951, U.S. aircraft carriers were starting to carry non-nuclear components (less the fissile material core), which suggests that 1953 was the first year when the carriers were carrying complete nuclear weapons, consistent with the Eisenhower administration’s new policy of dispersing nuclear weapons to the armed services. Nuclear Weapons Briefing for Fulbright Committee. 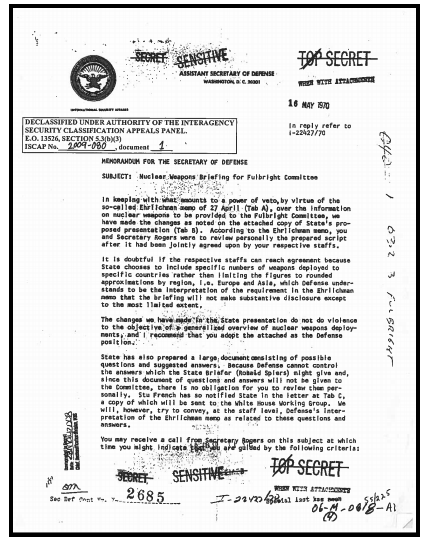 As for the request for declassification of the numbers of U.S. nuclear weapons in Cold War Western Europe, a letter from the Department of Energy informed the Archive that the FRD/ DWG has decided that the request “cannot be granted at this time.” No explanation was provided, although the decision is consistent with the Department of Defense’s historic refusal to declassify numbers of U.S. nuclear weapons in Europe; the exact size of the current deployment in Western Europe is as much an official secret as the deployments of the past.1 Nevertheless, this is a puzzling decision. It is not even secret that the U.S. deployed nuclear weapons in Western Europe during the Cold war; for example, in 2013 the Interagency Security Classification Appeals Panel (ISCAP) declassified significant portions of a briefing to the Senate Foreign Relations Committee from 1970 on U.S. nuclear deployments overseas. ISCAP not only disclosed the fact that the U.S. had nuclear weapons deployed in NATO Europe, it listed the countries with which Washington had nuclear cooperation agreements covering stockpile arrangements: Belgium, Canada, Germany, Greece, Italy, the Netherlands, Turkey, and the United Kingdom. Given such declassifications the number of weapons during the Cold War is really only an interesting detail. Even during the Cold War the numbers of weapons in NATO Europe were not highly secret. 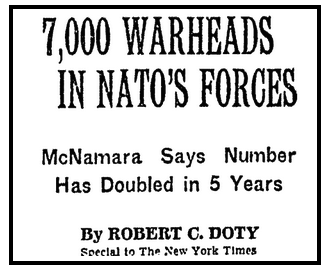 In September 1966 when Secretary of Defense Robert McNamara was in Rome to organize NATO’s Nuclear Planning Group, the size of the stockpile quickly leaked to the New York Times: the headline stated: “7,000 Warheads in NATO’s Forces: McNamara Says Number Has Doubled in 5 Years.” As Washington Post reporter Murrey Marder observed some years later the numbers would go up and down, but the 7,000 figure remained the best approximation.2 Even when President Bush ordered the withdrawal of thousands of nuclear weapons from around the world in 1991, the number of weapons that had been deployed to Western Europe remained an official secret. It is not at all clear why the U.S. government is afraid to declassify the numbers. The agencies always cite the Atomic Weapons Act as constraining release but in the past they have interpreted it to declassify other stockpile numbers. There is no absolute prohibition. It would be better if the agencies followed the pragmatic British who have declassified much data about their nuclear stockpile during the Cold War, including weapons types and numbers, where they were deployed, and even their explosive yields. John R. Walker, an official historian at the British Foreign and Commonwealth Office has impressively compiled such data in several articles published in The RUSI Journal.3 It is remarkable that, even with the Official Secrets Act, a British public historian could produce such useful research, with full citations. It is a sad commentary that such an accomplishment is impossible in this country. 3. John R. Walker, “British Nuclear Weapons Stockpiles, 1953-78,” and “British Nuclear Weapons Stockpile, 1953-1978: A Commentary on Technical and Political Drivers,” RUSI Journal 156 (October/November 2011): 66-72 and 74-83 respectively.